All Stoney End harps have a similar construction. Solid Walnut or Cherry wood for the structural frame and pinblock. The plywood side and back panels are inserted into dado cuts in the solid corners and the base. This makes a durable and strong, yet very lightweight harp body. The soundboards are the heart of the good sound, made from a Finnish aircraft grade 3 millimeter Birch laminate. This provides exceptional strength with low wieght and allows cutouts on both the bottom and top ends of the string band. This opens up the soundborad and makes it free to vibrate over its entire surface , something that thicker, stiffer, more confined soundboards cannot do. 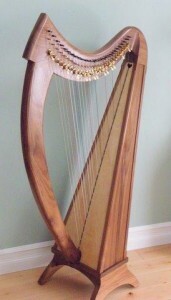 No other small harp is able to produce the good sound that the Stoney End does. A good combination of good sound and affordable price anywhere in the world today.